When the barometric pressure in Bigfork Minnesota plummeted to 28.20 on Tuesday, October 26, possibly setting a U.S. record, I couldn't help but think of Wensell Frantzich's barometric pressure lecture in NWA stewardess school, circa 1957.He would have loved to expound on this week's phenomena. Wensell also taught first aid for the NWA Training Division. Above is the only photo of him I could unearth in the NWA History Centre archives yesterday. 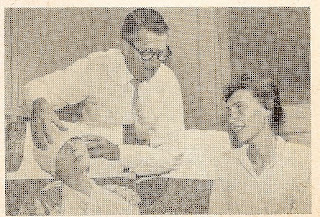 He is demonstrating on stewardess-in-training Mary Kay Racine. I'll bet there are more (at least better) photos - perhaps easily retrievable someday by an electronic archival cataloging system. Maybe in my lifetime? One can only hope. As soon as I raise enough money to re-upholster the pair of Boeing B-377 Stratocruiser seats donated to the museum, I'll turn my attention to archive cataloging. It's been fun to remember Wensell Frantzich. He had a great sense of humor. So - last Tuesday on the fateful low pressure day? How did your personal interactions fare? I was feeling no pressure at all - that I remember, anyway. It was great fun seeing the article about my father. He was one of a kind. He certainly enjoyed his teaching. Aircraft Evacuation Slide-1950s Style . . .